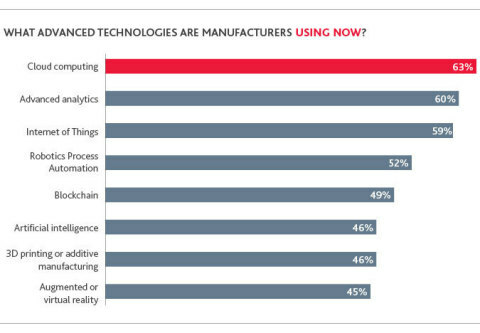 Ninety-nine percent of middle market manufacturing executives today are at least moderately familiar with Industry 4.0, according to BDO's Middle Market Industry 4.0 Benchmarking Survey. But while more than half (54 percent) of middle market manufacturing executives have either developed or are in the process of developing an Industry 4.0 strategy, only 5 percent are currently implementing one. Another 25 percent plan to develop an Industry 4.0 strategy, but have yet to get started on it. "Over time, Industry 4.0 will radically transform how manufacturers derive and deliver value," said Eskander Yavar, Industry 4.0 co-leader and national leader of BDO's Management & Technology Advisory Services. "But the window of opportunity is closing fast. Manufacturers who don't invest in 2019 risk falling behind the curve. The middle market is no exception." Middle market manufacturers know that Industry 4.0 has the potential to transform their business. As they look beyond their immediate needs and toward tomorrow's digital future, most (71 percent) are prioritizing business model diversification above all else; which suggests a fundamental shift in customer demand that can't be met by the traditional manufacturing toolset. Improving operational efficiencies and increasing market penetration tie as the second most-cited goals, at 67 percent each. Successful Industry 4.0 adoption requires collaboration between functional areas of the business that have historically operated in silos, like information technology and operations technology. Two in three executives view poor communication as the biggest barrier to successful Industry 4.0 implementation. Rounding out respondents' top five implementation barriers is interoperability with legacy technology (64 percent), lack of skills or insufficient training (63 percent), lack of leadership and vision (60 percent), and underinvestment (54 percent). In an idealized Industry 4.0 world, supply chains become the digital thread-integrated value chains with end-to-end traceability and transparency, enabled by the constant, bi-directional flow of information. Most middle market manufacturers, however, aren't there yet. While just 7 percent of respondents say their data is totally siloed, pointing to increased information sharing internally, only 6 percent claim they have transparency across the entire value chain. "Manufacturers must evolve their businesses to be successful in a service economy," said Rick Schreiber, Industry 4.0 co-leader and national practice leader of BDO's Manufacturing & Distribution practice. "That evolution starts with small, incremental investments in Industry 4.0 that deliver immediate ROI, while building towards a more digital future."